We’d love your help. Let us know what’s wrong with this preview of Healing Developmental Trauma by Laurence Heller. Although it may seem that humans suffer from an endless number of emotional problems and challenges, Healing Developmental Trauma presents a model for psychotherapy and growth showing that most emotional difficulties can be traced back to the compromised development of one or more five core capacities. These five core capacities are associated with biologically based core Although it may seem that humans suffer from an endless number of emotional problems and challenges, Healing Developmental Trauma presents a model for psychotherapy and growth showing that most emotional difficulties can be traced back to the compromised development of one or more five core capacities. These five core capacities are associated with biologically based core needs that are essential to our physical and emotional well-being: the needs for connection, attunement, trust, autonomy, and love-sexuality. Recognizing these needs as well as five Adaptive Survival Styles set in motion when the core needs are not met early in life, authors Laurence Heller and Aline LaPierre cut through the seeming complexity of life’s problems. Explaining that an impaired capacity for connection to self and to others and the ensuing diminished aliveness are the hidden dimensions that underlie most psychological and many physiological problems, they introduce the NeuroAffective Relational Model® (NARM), a resource-oriented, psychodynamically informed approach that, while not ignoring a person’s past, emphasizes working in the present moment. NARM uses somatic mindfulness to re-regulate the nervous system and to resolve identity distortions—such as low self-esteem, shame, and chronic self-judgment—caused by developmental and relational trauma. Heller and LaPierre demonstrate how this therapy helps clients establish connection to the parts of self that are organized, coherent and functional, integrating the role of connection on all levels of experience as it affects a person's physiology, psychology, and capacity for relationship. To ask other readers questions about Healing Developmental Trauma, please sign up. This appears to be the incorrect title. The actual title is Healing Developmental Trauma. Was this an early title? This book really illuminates the trauma experienced in childhood when primary caregivers are unable to provide healthy attachment experiences with their children either because they suffer from addiction, mental illness, or have not worked through their own attachment trauma. Heller really puts some amazing pieces together to form a whole picture of how adaptations to early attachment trauma create patterns of behavior that carry into adulthood. The science behind the physiological responses to This book really illuminates the trauma experienced in childhood when primary caregivers are unable to provide healthy attachment experiences with their children either because they suffer from addiction, mental illness, or have not worked through their own attachment trauma. Heller really puts some amazing pieces together to form a whole picture of how adaptations to early attachment trauma create patterns of behavior that carry into adulthood. The science behind the physiological responses to trauma is increasingly becoming a part of informed treatment in working with clients healing from all types of trauma and is so important in overcoming barriers (often mislabeled as resistance) and avoiding re-traumatizing clients in the therapeutic setting. Draws together all major lines of theory, research - accurately so IMO. Their approach views developmental trauma as leading to five main adaptive/organizing styles, depending on age when trauma began relating to connection, attunement, trust, autonomy, and love-sexuality. Most of the book addresses how to deal with connection difficulties, but arguably all are intertwined. A couple of chapters give case studies of how therapy may proceed from this model. It is a somatic approach - and is similar Draws together all major lines of theory, research - accurately so IMO. A couple of chapters give case studies of how therapy may proceed from this model. It is a somatic approach - and is similar, if not indistinguishable to many forms of therapies such as Hakomi, somatic experiencing etc., at which point the particular model and theory cease to have importance in my view. For the amount of information that's in there, it's an easily understandable read. I felt the authors' presence and humaneness when reading, definitely not always the case. They appear to have an deep understanding of the intricate difficulties those with developmental trauma experience - there were some insights I had not thought of before; it makes for a full read. And whilst clinical examples are given, arguably, we've all suffered less that perfect i.e. "good enough" parenting, thus there are aspects anyone will be able to identify with and find use of in here. This book is a blueprint into our subconsciousness. It explains why all of us at times act in a very irrational way, why we can't quite control it, why we deny that fact and why we can also be resistant to seeking out or receiving the help we need. The authors present the subject matter in a very non-judgmental and non pathological way; they use cause and effect approach. They also don't just present a problem, they present a healing approach that is holistic as it draws upon many different psych This book is a blueprint into our subconsciousness. It explains why all of us at times act in a very irrational way, why we can't quite control it, why we deny that fact and why we can also be resistant to seeking out or receiving the help we need. The authors present the subject matter in a very non-judgmental and non pathological way; they use cause and effect approach. They also don't just present a problem, they present a healing approach that is holistic as it draws upon many different psychological treatment approaches. Overall, this book is written in accessible scientific language. It was very enlightening for me to understand myself as well as others, and that we are all somewhat damaged (whether it be intentionally or unintentionally) by our families of origin. “As a result of the earliest trauma, individuals with the Connection Survival Style have disconnected from their bodies, from themselves, and from relationship. Connection types have two seemingly different coping styles or subtypes: the thinking and Overall, this book is written in accessible scientific language. It was very enlightening for me to understand myself as well as others, and that we are all somewhat damaged (whether it be intentionally or unintentionally) by our families of origin. “As a result of the earliest trauma, individuals with the Connection Survival Style have disconnected from their bodies, from themselves, and from relationship. Connection types have two seemingly different coping styles or subtypes: the thinking and the spiritualizing subtypes. To manage the pain of early trauma, some individuals disconnect from their bodies and live in their minds. They value thinking and logic over feelings and emotions. Other individuals, having never embodied, manage their disconnection by spiritualizing their experience. These individuals tend to live in the energetic field, in more ethereal realms. Individuals of both subtypes are disconnected from their bodies and when asked what they are feeling in their body, find the question challenging, anxiety producing, and often impossible to answer” (37). A really useful book for anyone dealing with the effects of childhood trauma, or even the consequences of later "shock" trauma. With a small grounding in these techniques some decades ago, I have by instinct worked out ways to process much of the traumatic experiences that have been so much part of my life, both childhood abuse and combat related ptsd. This book just formalized my own approach and provided reinforcement of my internal sense of conviction that this is the way forward and of my se A really useful book for anyone dealing with the effects of childhood trauma, or even the consequences of later "shock" trauma. With a small grounding in these techniques some decades ago, I have by instinct worked out ways to process much of the traumatic experiences that have been so much part of my life, both childhood abuse and combat related ptsd. This book just formalized my own approach and provided reinforcement of my internal sense of conviction that this is the way forward and of my sense of trust in the process. It has been so validating to see my own experience recounted by someone with a professional background and understanding. Lawrence Heller and Aline Lapierre deliver a brilliant synthesis of developmental psychology, psychoanalytic theory and the work of Peter Levine (Somatic Experienceing). Heller and Lapierre bring together "top down" and "bottom up" approaches to understanding and intervening in with challenges of developmental trauma and nervous system disregulation which are critical in understanding emotional wellbeing. This book extremely well written and easy to digest despite the complexity that is addressed Lawrence Heller and Aline Lapierre deliver a brilliant synthesis of developmental psychology, psychoanalytic theory and the work of Peter Levine (Somatic Experienceing). Heller and Lapierre bring together "top down" and "bottom up" approaches to understanding and intervening in with challenges of developmental trauma and nervous system disregulation which are critical in understanding emotional wellbeing. This book extremely well written and easy to digest despite the complexity that is addressed here. Reading it is an absolute joy and filled with key insights. There are many helpful graphics and case examples. If I were just reviewing the second half of this book I would give it four stars. The clinical vignettes, interventions, and approach to psychotherapy are illuminating, exciting, and immediately applicable. The focus on the body, integrating experience, and facilitating self-regulation are excellent clinical interventions that are described systematically and coherently. I am considering the multi-year training course because I can easily see how these methods could be of valuable use in clinica If I were just reviewing the second half of this book I would give it four stars. The clinical vignettes, interventions, and approach to psychotherapy are illuminating, exciting, and immediately applicable. The focus on the body, integrating experience, and facilitating self-regulation are excellent clinical interventions that are described systematically and coherently. I am considering the multi-year training course because I can easily see how these methods could be of valuable use in clinical practice. A superb synthesis of body-centered approaches, bonding theory, neuroscience, trauma theory and ... more. It feels fresh, wise, and original. Great case examples, including commented session scripts. Very interesting work with gaze is described. Whilst this book contained some very interesting information, some chapters were really difficult to get through, especially in terms of repetition and writing style. A bit difficult to get into but well worth the read. Excellent reference for those who work with hurting people. – The price of freedom is eternal mindfulness. Trauma comes in many forms. The form that most people know is shock trauma from individual events. For example, nearly choking to death via umbilical cord in birth. You can’t even have a memory of that, but it can still cause post-traumatic symptoms throughout life. A more common, but less known, form is developmental trauma, which is a prolonged or repetitive exposure to threatening events as a young one. For example, prolonged neglect or isolation can produce a post-traumatic stress disorder. Trauma comes in many forms. The form that most people know is shock trauma from individual events. For example, nearly choking to death via umbilical cord in birth. You can’t even have a memory of that, but it can still cause post-traumatic symptoms throughout life. A more common, but less known, form is developmental trauma, which is a prolonged or repetitive exposure to threatening events as a young one. For example, prolonged neglect or isolation can produce a post-traumatic stress disorder. Trauma is seen as a psychological issue. However, it is stored in our bodies. Traumatic experiences dysregulate our nervous systems and can ratchet up our parasympathetic responses, leading to symptoms of ADD, depression, bipolar, borderline, etc etc. Developmental trauma is often underdiagonsed or diagnosed wrongly as a more common mental illness. I'm not a therapist, so I cannot evaluate this book for its clinical use, but as a lay person I found the explanation of the NARM (neuroaffective relational model) therapeutic approach accessible. 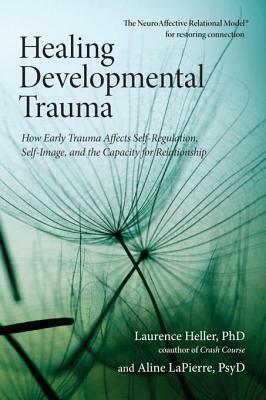 Heller thoroughly describes the physiological responses to trauma at an early age, how the body locks in the memory of trauma, and what kinds of therapy help unlock and process each traumatic manifestation. Dense but very important work about how to work with people who have suffered subtle to intense neglect in early childhood, how that affects us know, and the nuances of therapy that are important to keep in mind with different kinds if attachment issues that each person may have experienced. Oof. Intense self-learning. A bit jargony at times, but a good read for understanding your own and others' trauma. As professional psychologist, I find this approach absolutely groundbreaking. I am aware it's personal preference, but with NARM I found a piece that I always felt was missing in my work. I really love this book. It's kind of over my head, but there's so much to learn. Overall interesting. I was very disappointed by the lack of research or references in this book. Great resource for those who wish to get information about the correlation between early trauma and its effects on attachment. The reverse of psychoanalysis.It is a Fu*king amazing book. A fantastic book with huge insight into how experiences in early life through birth & childhood shape the dysfunctional thought processes that plague so many of us in adult life. The main chunk of the book dissects the 5 most common maladaptive personality types & as each chapter unfolds you will recognise yourself & others around you & feel almost voyeuristic as you suddenly understand exactly why those people are the way they are. The latter part of the book then walks you thro A fantastic book with huge insight into how experiences in early life through birth & childhood shape the dysfunctional thought processes that plague so many of us in adult life. The main chunk of the book dissects the 5 most common maladaptive personality types & as each chapter unfolds you will recognise yourself & others around you & feel almost voyeuristic as you suddenly understand exactly why those people are the way they are. The latter part of the book then walks you through a couple of case studies of patient therapy sessions to give an insight into how these maladaptive behaviours may be treated. What I really like about this book is it doesn't dumb anything down. Written as a guide for both therapists & people seeking to learn more about their own personalities it tackles things in full without any of the simplified interpretations offered in popular self help guides. Learning the causes of maladaptive thinking gives you an understanding of why you are the way you are allowing you to tackle the root of the problem rather than just plastering over the cracks & expecting them not to resurface. Very good stuff here that makes a lot of sense yet the content is complex and innovative. I learned concepts that I have been able to apply to my practice and my understanding of my self and loved ones. This book is written for the professional therapists. It is one long commercial for a certain type of treatment, called "NARM", NeuroAffective Relational Model. It was a long and involved read and I needed to look up a few words. It didn't really help me understand Complex PTSD anymore than I had. Dense, well-edited summary of a practical approach to early trauma. One of the very few theories that make a distinction between traumatic event and a traumatic eg.neglect. Perfect for practitioners to see certain struggles of clients in a different light. Need more! Very well written, backed by research. Even though meant for therapists very accessible. Plan to read through again to absorb and really incorporate into daily life more of the content and suggestions.